I was conversing with a blogger friend some time last week and we both agreed that it was the first time that we had seen both locally grown strawberries and blackberries side by side. It has been a strange summer, not that I am moaning it has been a fabulous change from the dreary persistent rain that has overshadowed me since I moved back to Wales. So its been nice to see the sun still shining, though the early mornings and evenings are beginning to get a bit nippy on the cheeks. Anyway, whilst house-hunting on the outskirts of the city, my husband pointed out to some bramble bushes that were gleaming all manner of ripening colour. I ran back to the car to get a carrier bag and between us we managed to forage quite a lot, getting our fingers ruddy red in the process. I new exactly what I wanted to do with them when we got back home - Raw Vegan Pie. I've never made a raw vegan pie before and this was my opportunity to have a go. 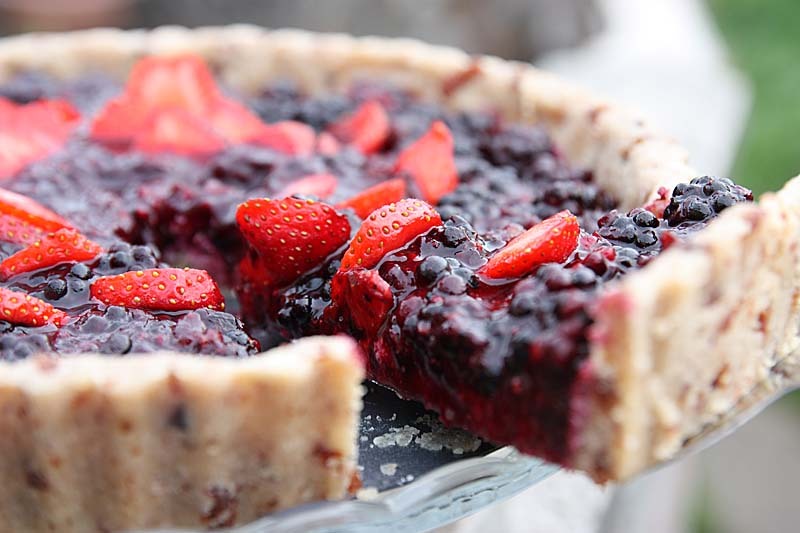 As well as the foraged black berries, I added some strawberries to the pie, only because I had them in my fridge. It was such a large pie, that no way would D and myself be able to eat it between us, so I ended up sending half of it over to my parents who shared it with some other members of the family. My mother really liked it, some of the little ones were not that keen expressing that the blackberries were a tad too sharp and seedy for them, but that is what we liked about it. The cinnamon almond crust is very intriguing too, it reminded me a little of South Asian sweets such as Burfi, especially those made with dried fruit and nut. It was actually quite delightful and chewy. I did have a little trouble prising it out of the pie dish, but I had not trouble in eating it. Yum. 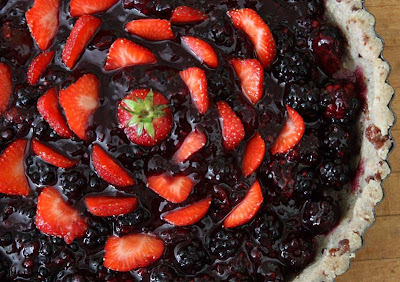 I am sharing a slice of this Fresh Strawberry and Blackberry Pie with Four Seasons Food 'Sliding into Autumn' theme. 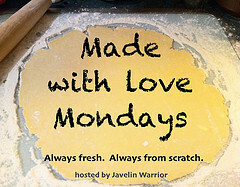 Four Seasons Food hosted by Anneli of Delicieux and Louisa at Chezfoti; as well as Javelin Warrior's for his Made with Love Mondays; and Ricki at Diet, Dessert, Dogs for her Wellness Weekends 5-9 September. Place the almonds, salt and cinnamon in the bowl of a food processor. Blitz until finely ground. Add in the sultanas/and or raisins, maple syrup, vanilla and 1 tablespoon of cold water and blitz until the mixture begins to stick together to form large doughy clumps. Tip the mixture into the pie dish and using your fingers, distribute evenly along the bottom and the sides to form and even layer. Press to compact with your hands, shaping the crust flat around the rim. The thickness of the pie should be about 8mm thick. Chill in the refrigerator for 30 minutes or longer if your can. Place about 250g / 2 cups of the blackberries, the dates, maple syrup and lemon juice in the bowl of a food processor and process until smooth. Transfer to a large bowl and stir in the remaining blackberries. Pour the filling into the pie crust and distribute evenly with a spatula. Then evenly distribute the strawberry slices in between the blackberries in the pie. 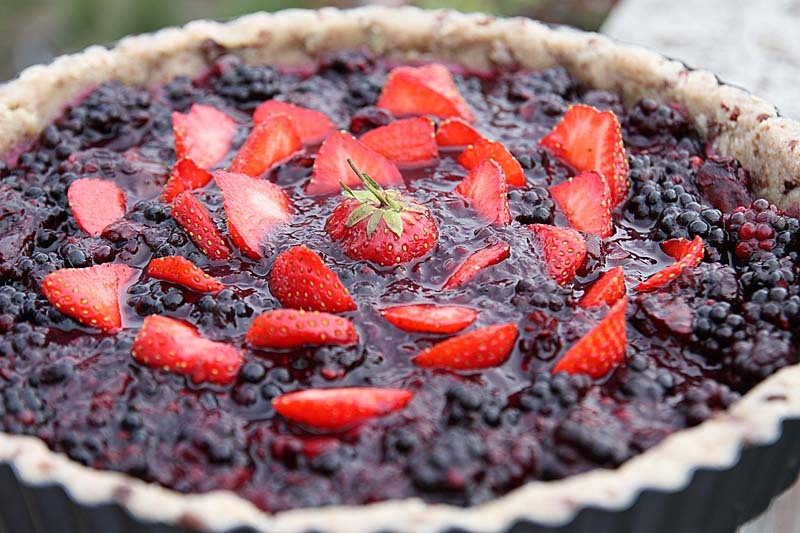 Refrigerate for two hours then cut into slices and serve chilled with optional ice-cream or cream on the side. Keep refrigerated and best enjoyed within a four to five days. This looks good! There are still some blackberries in our garden, but I don't know if it's enough to put into this pie, have to check that out soon. 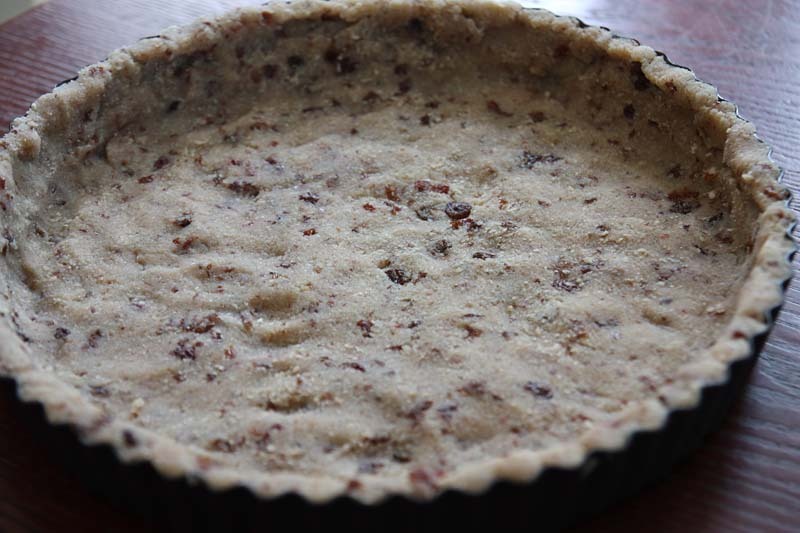 I've never made a raw pie before, but it sure is time to try it (I think i'm saying this for about 2 months now...). Hope you able to forage for enough blackberries. Beautiful! 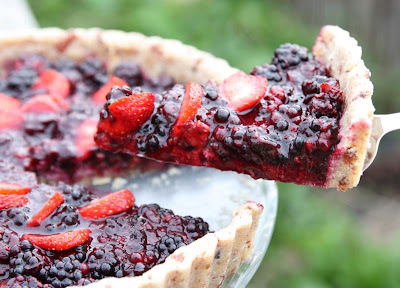 I can imagine that crust being a friendly host to all kinds of seasonal berries! I hope I remember this next year when my raspberries are in full-swing. Yes RuckusButt, I agree this pie crust would take other berries too. I hope you get to try it next year. what a beautiful pie - I am glad there are some unexpected joys in househunting! What an interesting tart, one to bookmark! Blackberry Ice-cream - Yum, I will be coming on over. I need to go foraging again,want more berries. Thank you so SO much Anneli.